Friday night in a hotel in Tegucigalpa I learned that Pope Francis had referred to Thomas Merton and Dorothy Day in his speech to the US Congress. Here are some of my initial thoughts. I was flabbergasted and ecstatic! These two Catholics were both converts and corresponded with each other. Thomas Merton, after a profligate youth, became a Catholic and entered the Trappist Abbey of Gethsemani in Kentucky. His autobiography, The Seven Storey Mountain, was a best seller which omitted some details of his pre-monastery life, including the child he engendered. Dorothy Day, after a young adulthood spent in radical causes as well as a child out of wedlock, became a Catholic, spurred on by the birth of her child. Her autobiography, The Long Loneliness, also omitted some details of her pre-conversion life, including an abortion. Thomas Merton might have disappeared into the monastery, writing pious books, but he was stirred by his reading of the signs of the times and wrote on race, war and peace, nonviolence, and other religions. His contemplation opened him to the pain and suffering of the world. Dorothy Day might have continued her work with the poor at the Catholic Worker, which she co-founded with Peter Maurin. But she combined her activism and her direct service of the poor with a deep spirituality which included daily Mass and praying the Liturgy of the Hours. Merton and Day show us that contemplation and radical social advocacy are not separated in the eyes of God. Do not despise it when it is naked. while outside it is naked and numb with cold. “You saw me hungry and you gave me no food. For what God needs is not golden chalices but golden souls. Perhaps it’s because he was a lay Filipino father of a family who was martyred in Japan in 1637, but something about Saint Lorenzo Ruiz intrigued me. 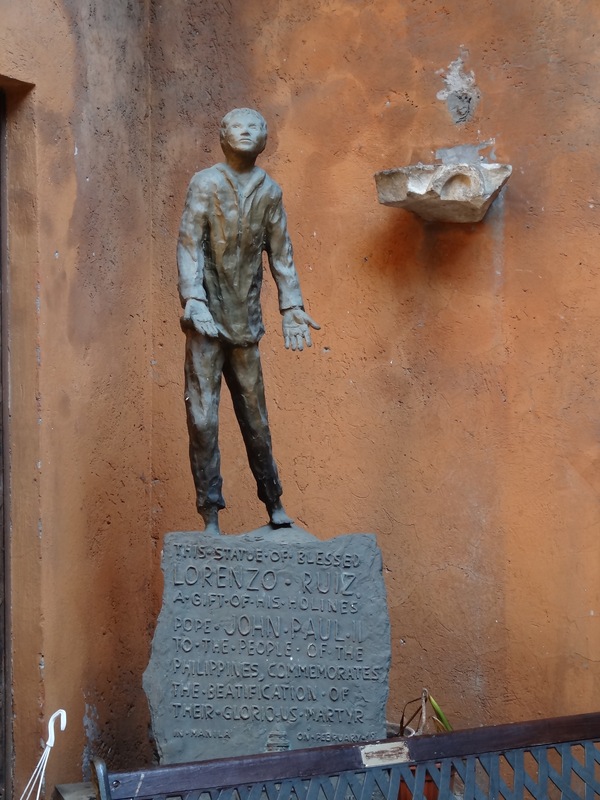 When I was in Rome in February, 2013, I happened upon his statue in the church of Santa Prassede. But reading the short biography of Saint Lorenzo in Saint of the Day: Updated and Expanded by Leonard Foley, OFM. I found myself fascinated by this reluctant martyr. Lorenzo, an accomplished calligrapher, was married and a father of four. He was a member of the Dominicans’ Confraternity of the Rosary. Finding himself accused of murder in the Philippines, he fled for protection with some Dominicans who just happened to be leaving for a mission in Japan. He joined them but didn’t realize that they were going to Japan until they were at sea. At this time, it was dangerous to be a Christian in Japan and many were brutally martyred for their faith. When the ship docked at Okinawa, Lorenzo could have left but decided to go ahead with the priests, perhaps fearful that he would be tried and hanged for murder in Okinawa. Soon after they reached Japan, they were arrested and taken to Nagasaki and subjected to torture. At one point Lorenzo asked the interpreter if his life would be spared if he apostatized and denied the faith. He did not receive a clear answer but, as Saint of the Day reports, “Lorenzo, in the ensuing hours, felt his faith grow strong. He became bold, even audacious, with his interrogators. He finally died on September 28 after three days of torture. He is the first Filipino canonized saint. What strikes me is that his martyrdom was not sought; in fact, his death seems like an accident, a bit of bad luck, with a few mixed motives. But, despite this, God worked through Lorenzo and Lorenzo responded – although reluctantly. God calls us in the midst of our lives and we can respond in many ways, even reluctantly. But in the end, it’s God’s grace that enables us to respond in love. May the example of St. Lorenzo open us to see God calling us in ways we might never expect and helping us to be firm in faith, even in the face of trials. Will the poor forgive me? Pope Francis in his trip to the United States has given us an example of God’s love for and identification with the poor and the marginalized – visiting places where the poor are fed and where the marginalized are put into prison. He often speaks of the culture of encounter. We are not only called to be on the side of the poor, we are called to be with them in person – in the manner in which we can do this, meeting them as persons. It is easy to love the poor as a group and to advocate for them. It is not so easy to be with them. It can be threatening – we don’t know what to expect. But to accompany the poor means that we let ourselves be challenged by the poor, to learn from them, and to be with them without a sense of superiority. Otherwise our charity becomes a way of proving ourselves superior to the poor or to those who do not “help” the poor as we do. How ought we to practice charity? With gratitude, with love, with respect, with openness to the other. As Dostoevsky wrote, “Love in action is a harsh and dreadful thing, compared to love in dreams. Will the poor forgive me as I live here? Will they recognize their dignity and their capacities in my presence? Will they recognize how they are truly children of God and my sisters and brothers? Will they forgive me? Every morning I try to read about the saints and events from the day. I have assembled my own calendar of persons, events, and quotes but I also rely on Robert Ellsberg’s All Saints and Richard McBrien’s Lives of the Saints. I also occasionally read María Berta Arroyo’s Profetas para un Mundo Nuevo, the second volume of short accounts of the martyrs of Latin America. The entry for September presents a lesson that we could all learn. Fortunato Collazo was a leader of his neighborhood, Juan Pablo II, in the district of San Juan de Lurigancho. In the early hours of the morning of September 14, 1991, a group of Sendero Luminoso guerrillas broke into his house to kill him. Another leader, Alfredo Aguirre, was awakened and walked into Fortunato’s house. Such love, such solidarity, such sense of our connectedness are so needed in our world. What would it be like if took Alfredo’s words to heart? If it affects my neighbor, it affects me. Today’s Gospel, Mark 7: 31-37, is full of surprises, revealing a God who acts in new and imaginative ways. The man who is deaf and has trouble speaking does not come to Jesus on his own. Others bring him. Did he fear coming to Jesus, not being able to tell Him what he wanted? Or did he not realize his condition and therefore did not see the need to come to Jesus for healing? Or did he not think that Jesus could or would heal him – after all he’s just another deaf-mute? But Jesus takes him apart and heals the man, touching his ears and putting spittle on his tongue. A word was not enough. Jesus touched him. The man’s voice was returned to him. The Greek of the last line struck me: ἀλάλους λαλεῖν. It could easily be translated as giving voice to the voiceless. Jesus opened the ears of the man so that he could hear the words of God to “open up,” to listen to the Word of God, a word that calls us to live our true dignity as children of God. But he also gives the man the gift of being able to speak rightly, clearly. He restores his true voice to the man. So many people do not have a voice in this world. Sometimes we do not speak up because of fear, because of timidity, because we have not listened to the Word of God and heard the cries of the poor and vulnerable. But so many are without voice, not heard, not listened to. Or their voices are muffled. Or they have given up speaking because of the indifference of others. Or the hears of those who could hear are closed to them. But Jesus heals and gives the poor back their voice – if we would listen. This is what I think people like Monseñor Romero did for the people of El Salvador in the late 1970s, letting them lift up their voices. He is often called “the voice of the voiceless” but he was also one who affirmed the people when they raised their voices against the repression. This is what I think the Guatemalan bishops just did when they supported the people of Guatemala who were calling for an end to corruption and impunity and then took to the streets to call for the resignation of a corrupt president. This is what I think Pope Francis is trying to do and what he did when he held the open meeting via ABC News with refugee families in Texas, with homeless people in Los Angeles, and with poor young students at Cristo Rey school in Chicago. It’s what God can do with us, letting us listen to the poor, the refugee, the marginalized and letting their voice be heard. Last night I had a strange dream in which I was playing “O Sacred Head surrounded,” a Lenten hymn, on an organ. I was playing it without sheet music. I woke and the hymn went through my mind numerous times. 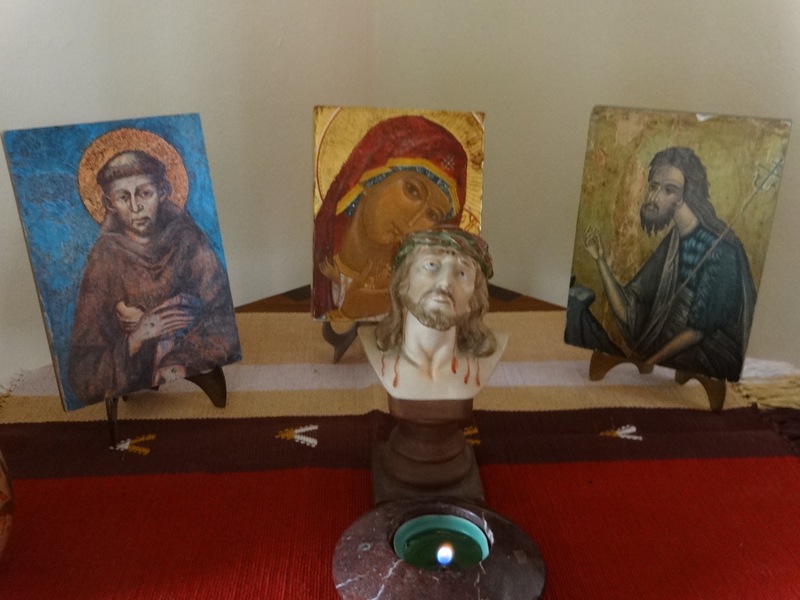 When I woke up I brought an image of the Head of Christ I have and placed it in my prayer corner. Before praying I listened to five different renditions of the hymn. Gazing on the head of Christ, I am reminded of the compassion, the compassionate mercy of God for us. God wishes to be with us, born poor, living and dying poor. Today just happens to be the feast of Mother Teresa of Kolkata, who saw the face of Christ in the poor, in the least of these. But I think she could do this because she sought to place herself in the presence of God and, though she suffered a long dark night of the soul, I believe that sustained her. One young man asked him how to respond to the pain and suffer. Before he spoke about some practical responses, he first urged him – and all of us – to look to Jesus. May we learn to gaze upon the Sacred Head, “surrounded by crown of piercing thorn,” and upon the faces of all those who suffer and respond with a love that is real, rooted in an encounter with Christ and directly with those who suffer.